Urban Meyer and Ohio State stand between a one-loss SEC champion playing for the national title. No, there exists not a soul in Auburn, Ala., who should care. Not Nick Marshall or Tre Mason, the two chief cylinders that have kept this Auburn machine firing. Not Chris Davis, who ran 109 yards with no time on the clock Saturday, taking a missed Alabama field goal out of the end zone and running it into the beautifully delirious memories of all who witnessed Auburn’s 34-28 stunner at Jordan-Hare Stadium, into the most cherished of Alabama sporting annals. Not Gus Malzahn, a sweater vest-wearing savior of sorts for Auburn — the team and the town — a man who came back to the Plains after a year away at Arkansas State and promised only that he’d bring his offense and together they’d set out to find the magic they once shared, which was three seasons and a lifetime ago now. And certainly not the thousands upon thousands of pulsating Tiger hearts, who draped themselves in orange and blue over and over again while caught in the misery of a 3-9 season in 2012, their blind devotion exchanged for Saturdays saturated in embarrassment and pain. Davis’ dash down the sideline to beat No. 1 Alabama — giving No. 4 Auburn the SEC West title and a trip to Atlanta this week for the conference championship game — was one of those sports moments you witness in person once in a lifetime if you’re lucky and see on television maybe once or twice more. Auburn affiliation or not, those seconds should be cherished. They should be replayed and recycled and remembered forever. Watching perhaps the best ending to a college football game ever unfold on television, I felt the oddest sensation: almost nothing. Pictures moved on the screen ahead, bodies flailed and people screamed and cried, and it was as if some mechanism inside me decided that’s not real. It just can’t be. I imagine if I were at your Auburn tailgate or inside Jordan-Hare — another concrete infrastructure turned American gem in the fall — I wouldn’t be able to breathe, either. But inside a room, trying to comprehend what was happening and digest all the glory of the moment before moving on to the ramifications … nothing. My mind almost immediately reverted to a process of simple mathematics, inputting the final score as if it were some bloodless data point. Then the computing began. At this point, any sense of exterior delirium lifted, and the obvious was left dangling in plain view: Auburn’s most miraculous moment might also be a nightmare for the SEC as a whole. This one incredible play could keep the league out of the BCS championship game and end its streak of national championships without even a fight. Seven in a row, beginning with Florida in 2006, and the league might not even get a shot at an eighth. Again, this is the precise point at which nobody in Auburn should care, and I doubt anybody today does. Saturday night’s memory, beating Alabama in the most inexplicable fashion possible, was worth something a hell of a lot more expensive than regional pride. A piece of your soul, perhaps. But, still, there is this conference cost we must account for. In the name of preserving everything special about Auburn’s win and not rendering it another piece of trampled parking lot rubbish by overloading it with second-day WHAT IT ALL MEANS hysteria, let’s proceed with the simplest of facts and scenarios before returning to not believing anything we just saw. Florida State, should it beat Duke in the ACC championship game, seems like a lock for the BCS title game. The Seminoles have occupied the BCS standings’ second position, behind ‘Bama, for the past four weeks and will move into the top slot now. It doesn’t seem to matter that FSU ranks 90th in Brian Fremeau’s most recent strength of schedule ratings, with a road blowout of Clemson and a fairly ubiquitous belief that QB Jameis Winston is better than any player you might have carrying the case for the ‘Noles. Voters also see the weapons Winston can deploy — receivers Kelvin Benjamin and Rashad Greene, tight end Nick O’Leary, running backs Devonta Freeman and James Wilder, among others — and a defense that bullies opponents with Timmy Jernigan and Telvin Smith, among others, and they conclude Florida State’s strengths make its schedule weaknesses irrelevant. FSU leads the nation in yards per play at 7.83 and is second in yards per play allowed at 4.01, and so that, combined with its overwhelming amount of talent, is enough. Only a loss to Duke can keep the Seminoles out of the title game. So we’re left to determine who would play FSU in the title game, and that comes down to a simple question: Do you prefer undefeated Ohio State (if it escapes Michigan State) or a one-loss SEC champion? Auburn athletic director Jay Jacobs began this discussion in earnest Saturday night, not wasting a moment to begin playing politician. The Buckeyes have the Spartans next week in the Big Ten title game, and a “convincing” — as if the aesthetics should matter — win there would likely make it difficult for voters to keep them out of the national championship, despite its lackluster schedule, which ranks 99th. Ohio State ranks fourth in yards per play (7.33) and 24th in yards per play allowed (5.01). It can throw the ball with Braxton Miller, but mostly OSU wins by being better on the ground. With a mobile Miller and the gale-force power behind running back Carlos Hyde, the Buckeyes lead the nation in yards per rush at 7.05, almost 0.4 yards better per attempt than second-place Northern Illinois (6.66). How much do Urban Meyer’s championship reputation and the gravity of Ohio State’s tradition and brand matter to voters? That’s hard to quantify, but we all concede that it would matter to some decision-makers, right? If you don’t believe Ohio State to be worthy, then you’re taking the winner of Auburn-Missouri in next week’s SEC championship. Auburn would have a compelling case to be the No. 2 team in the country, holding the crown of the nation’s toughest league and wins over Texas A&M, Alabama and Mizzou. The Tigers’ second-tier victories — at Ole Miss, at Georgia — would be more on-paper impressive than any of Ohio State’s, save for the Big Ten title game. On the whole, Auburn’s resume overwhelms the Buckeyes’. If Missouri wins in Atlanta next week, the one-loss SEC champion argument would be a bit weaker. This isn’t a reflection of Mizzou’s production — 15th in the nation in yards per play (6.68), 32nd in yards per play allowed (5.14) — or talent, but rather a slate of wins that, while still better than Ohio State’s, doesn’t blow the Bucks away like Auburn’s does. Mizzou is very good — beating Texas A&M at home and Georgia and Ole Miss on the road — and very fortunate. The Tigers had the perfect blend of top-rung talent and luck this season, avoiding Alabama, Auburn and LSU from the SEC West. It will get its shot at Auburn next week, and James Franklin and Henry Josey and Michael Sam and the wideout tandem of L’Damian Washington and Dorial Green-Beckham is plenty good to win. Would Mizzou then earn the right to play Florida State for the national championship? My intuition says one-loss Auburn would give the voters a bit more pause than one-loss Missouri in deciding whether someone should leap Ohio State, but I don’t believe either would ultimately do it. The computers would favor the SEC team, but not enough human voters would spurn Ohio State’s perfect season, regardless of how much politicking Jay Jacobs does. Everywhere else in this SEC, this would sting. On the Plains, though, Saturday night was beautiful and miraculous, too good to be taken down by hypotheticals. Auburn won the Iron Bowl on a 109-yard spurt of unrestrained joy, a moment that will live forever and accompany thousands to their graves. 1. Ohio State beat Michigan in the Big House to retain bragging rights for another year and, more importantly, move into prime BCS title position. 2. 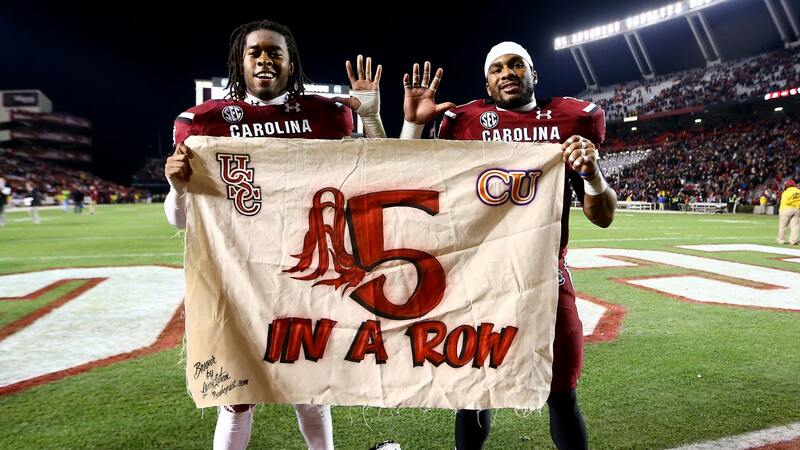 South Carolina beat Clemson for the fifth consecutive time to finish its regular season at 10-2. Good season for the Gamecocks, with one game to go. Enjoy the final collegiate game for Jadeveon Clowney. 3. 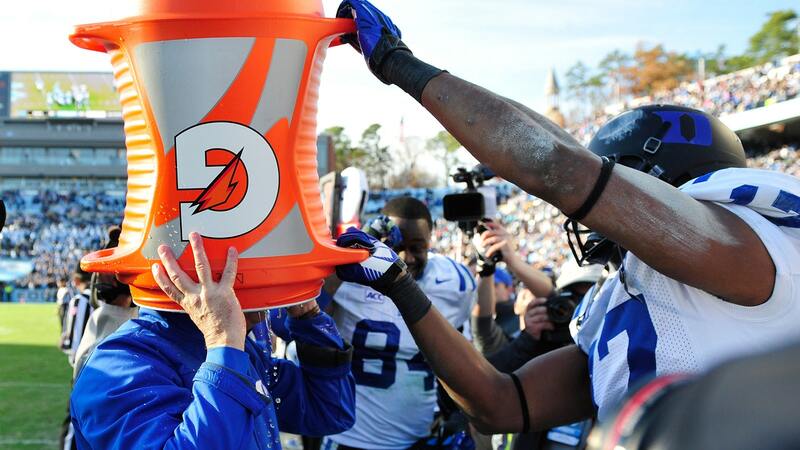 Can you blame David Cutcliffe for wanting to soak up every last drop of his Gatorade bath? Duke beat North Carolina to secure the program’s first 10-win season and take the Coastal Division crown. Next up: Florida State in the ACC title game. 4. 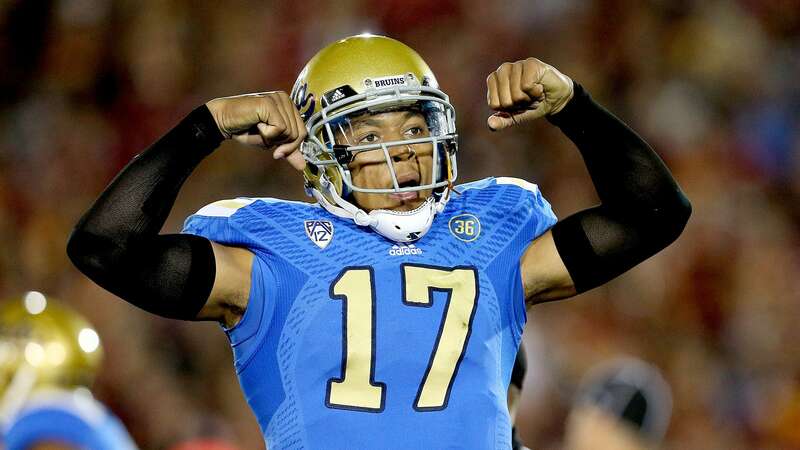 For the second year in a row, Los Angeles belongs to the Bruins after Brett Hundley and UCLA handled USC with ease in the Coliseum. 5. It’s been a frustrating year for Georgia with all the injuries, but the Bulldogs capped off the regular season by beating Georgia Tech in double overtime and have something to feel good about. 6. 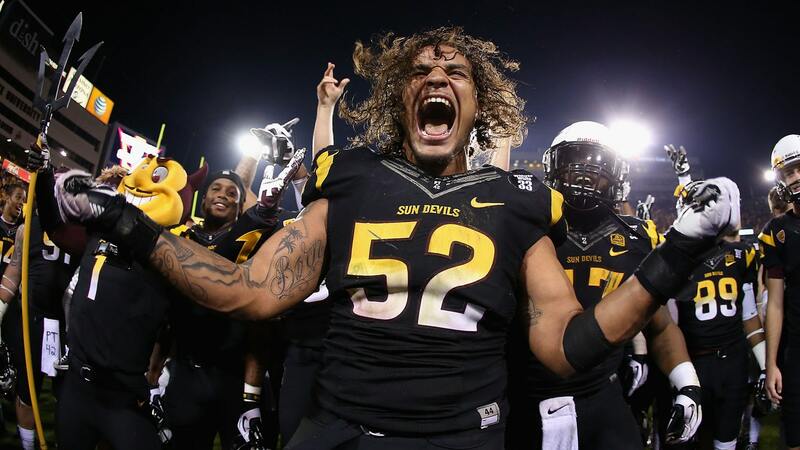 Arizona State beat Arizona by 37 and now will host Stanford next week in the Pac-12 title game. Go crazy, Tempe, go crazy. An assortment of links from around Week 14 in college football. I still can’t believe what happened at Jordan-Hare Stadium Saturday night. For Alabama, it has to be a feeling of overwhelming disappointment today, but that will pass. Whether you’re a Tide fan or not, there will be a time for everyone to look back on this McCarron/Saban run and appreciate what was accomplished (and there’s still one more game to play). A crazy season for Mizzou continues, as the Tigers beat Texas A&M to win the SEC East and will play Auburn for the conference championship. Remember when Gary Pinkel was on all of those hot-seat lists entering this season? That’s a long way from here. Georgia began a new era with the first career start of quarterback Hutson Mason, but it was a bunch of Todd Gurley that helped the Bulldogs beat Georgia Tech in double overtime. UCLA handled USC in the Coliseum, and that might do it for Ed Orgeron’s hopes of becoming the Trojans’ full-time head coach. Pat Haden will go through his process and hire whomever he believes is best to lead USC football, and that probably won’t be Orgeron. But isn’t it sort of silly to suggest all of that — a multiyear decision — was decided on this one loss to UCLA? Why do we do that? The Sun Devils will play for the Pac-12 championship but won’t have running back Marion Grice. TCU matching points with Baylor is one of the most surprising results from Week 14, although it wasn’t quite enough for the Horned Frogs, as they lost 41-38. It was the end of a disappointing year for TCU, as it finishes 4-8 and Gary Patterson heads into the offseason trying to figure out how to retool. Baylor, meanwhile, still has a great season in the works at 10-1 with a final game against Texas next week. Win that, and the Bears should head to a BCS bowl. Ohio State beat Michigan in a great game in the Big House. Little did the Buckeyes know that Saturday evening they’d be in position for a BCS title-game berth should they beat Michigan State in the Big Ten championship next week. The Wolverines put up a fight at home, but it wasn’t quite enough. It will be interesting to gauge the tenor of the conversations around Brady Hoke heading into next season. Hoke shouldn’t be on the “hot seat” entering the season, but it will be his fourth season and the Wolverines’ current trend is downward. And, well, people begin to talk at that point. Michigan State beat Minnesota to wrap its regular season at 11-1, and now the Spartans have an opportunity to go to the Rose Bowl. Wisconsin had a chance to cap a strong regular season at 10-2 and possibly go to a BCS bowl, but instead the Badgers finished up at 9-3 after losing at home to Penn State. Big-time game for Penn State freshman QB Christian Hackenberg, who completed 21 of 30 throws for 339 yards, four TDs and no picks. Duke beat North Carolina to clinch the first 10-win season in program history and win the ACC Coastal division. The Blue Devils will play Florida State in the ACC title game. What a year for David Cutcliffe, who should get a lot of love for the national coach of the year award. It took six years, but Cutcliffe finally has a winning season in Durham. As a Tar Heel, I’m excited for a full season of Marquise Williams in 2014. But UNC couldn’t quite finish against Duke. Side note: UNC tight end Eric Ebron set the ACC single-season receiving record for tight ends with 895 yards, breaking Vernon Davis’ record of 871 at Maryland in 2005. It was Ebron’s last game in Chapel Hill, as the junior has already declared for the NFL draft. For once, Jameis Winston wasn’t the biggest FSU story coming out of a Seminoles win, this one over Florida. 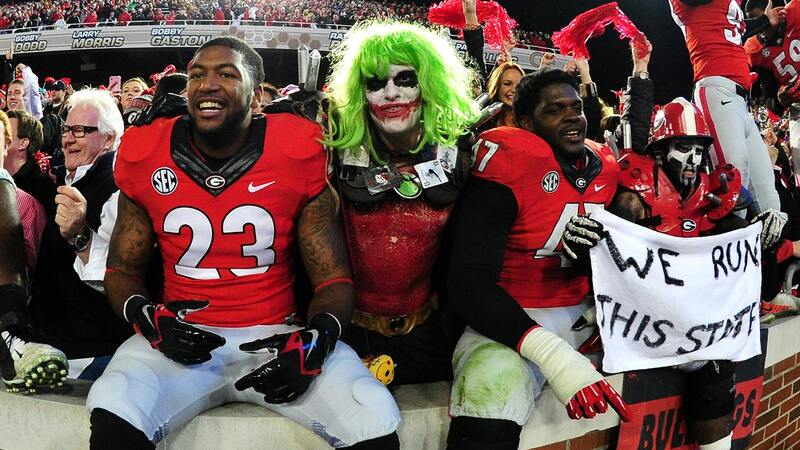 Today, all the talk is about Kelvin Benjamin and his monster day. Clemson couldn’t overcome all the turnovers against South Carolina. BCS buster update: No. 14 Northern Illinois stayed perfect by beating Western Michigan last Tuesday, while No. 16 Fresno State suffered its first loss, to San Jose State, on Friday and is out of the running. Teddy Mitrosilis writes and edits college football for FOXSports.com and blogs about reading and writing on his personal site. Follow him on Twitter here and email him at tmitrosilis@gmail.com.